Achieve savings with pump efficiency testing. 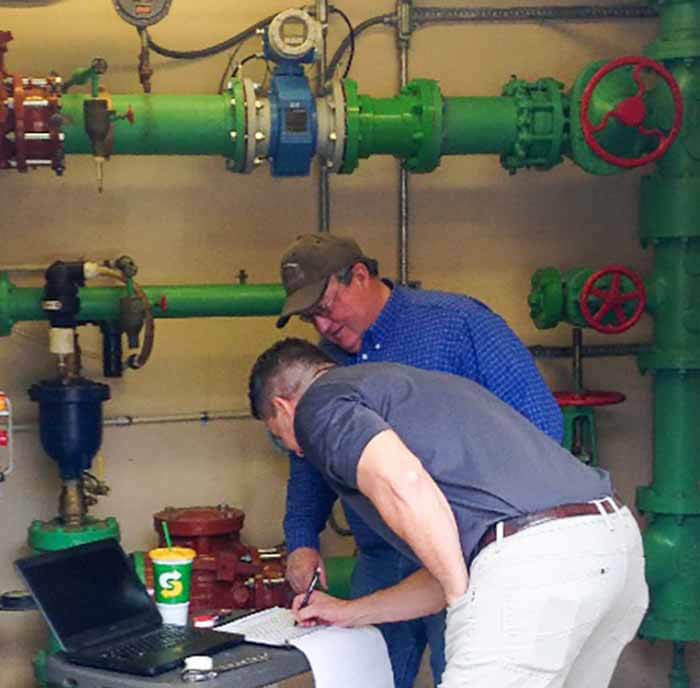 The following case studies, performed by the author, paint a picture of the savings that can be achieved with properly executed pump field testing. CRWD spends 93 to 99 percent of its total monthly energy operating cost on pumping water out of deep well aquifers that are 1,500 to 2,200 feet below ground. These wells also suffer from significant iron and manganese fouling that decrease the pipe cross sectional area and roughness coefficient. Evaluating the wire-to-water efficiencies of the top 10 of 68 highest energy consumption wells was a high priority. 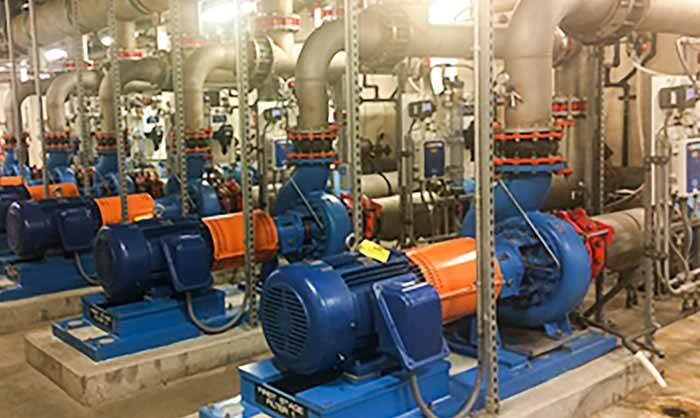 Field testing revealed that nine of the 10 variable frequency drive (VFD)-controlled, deep well pumps experienced wire-to-water efficiencies between 40 and 56 percent. EEMs were developed that were estimated to save more than 1,240,000 kilowatt hours per year (kWh/yr) and 500 kW. EEMs ranged from de-staging the well pumps due to higher pumping water levels than the original design, to operating two of the 10 well pumps at higher speeds so greater than 62 percent wire-to- water can be achieved. This mode of operation resulted in an extra 400 gallons per minute (gpm) production from operating the well pumps at higher speeds while allowing CRWD to turn off two 200 gpm, 200-horsepower (hp) well pumps that operated at 40 percent efficiency, so they can be de-staged. Increase the speed of a VFD so it pumps water and does not just spin in the casing. Increase pumping level in the clear well to reduce the kilowatts per millions of gallons per day (kW/mgd) by 15 percent. Add air release valves at top of split case pump casing and at several intermediate pipeline highpoints. Replace leaking check valve allowing 60 to 80 gpm to flow backwards through the pump. Install straightening vanes on split case pump suction to improve suction straight pipe lengths and balance impeller force load distribution. Lock out maximum hertz for certain pumps that cavitated at high speed. 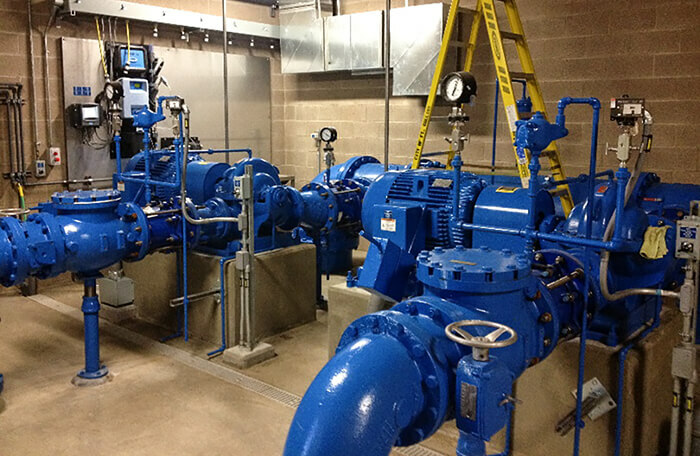 Wire-to-water efficiency testing was performed on the six 50-hp, VFD-controlled membrane feed pumps. Xcel Energy’s Demand Side Management (DSM) Rebate Program paid for $15,846 of the $21,128 fee to determine the wire-to-water efficiencies and develop EEMs that would result in lower kW/mgd. 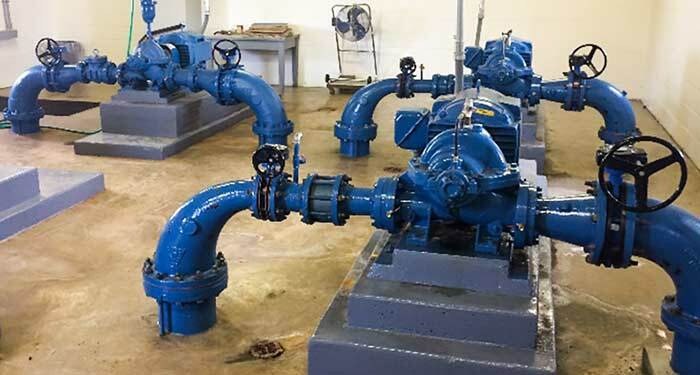 Testing revealed that five of the six pumps had wire-to-water efficiencies less than 30 percent during the low-flow operation totaling six months of the year.